Why Tree Removal is Not a Good DYI Project - Crowe Tree Service Inc.
Do you like doing some work around the house? Consider yourself a handyman? It’s great to have a do-it-yourself spirit but sometimes it is a good idea to hire a professional and in other instances it is more than just a recommendation but rather crucial to hire a professional to make sure the job is done properly and that you avoid injuring yourself. When it comes to tree removal in Ottawa, this is definitely one of those situations where you want to hire a professional to do the tree removal properly. If you try to remove the tree on your own you could end up damaging property or even worse you could damage yourself. Each year there are hundreds of professionals that hurt themselves performing tree removal not to mention the non-pros that decide to take up the tree removal task on their own. Many of us have even seen YouTube videos where people fall from trees or trees crush property and while some may laugh at these videos, it is no laughing matter and you can seriously injure – even kill – yourself if you try to remove a tree without knowing what you are doing. It’s much better to leave the risk to the professionals and hire us to do your tree removal in Ottawa. We have the team and the experience to remove your tree within your budget and to do it the right way making sure that nothing and no person is injured in the process. Even once a tree is down the risk is not gone because you can still injure yourself even when the tree is horizontal. This can happen in a number of ways such as the tree rolling on you or injuring yourself when cutting off limbs etc. To perform proper tree removal there is much more involved than simply cutting at the perceived right angle. There is an undercut and a backcut, which are techniques that are tailored to the particular tree’s condition, weather elements and conditions as well as the landscape surrounding the tree and much more. When it comes to having the perfect and safe yard you will want to make sure that any unwanted or unhealthy trees are removed. 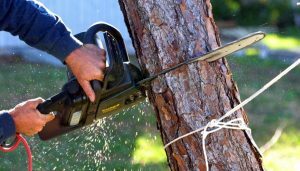 Before you attempt this task on your own it is highly advised that you contact us to discuss possible tree removal options so that you can get professionals involved to prevent injury and remove the tree properly.